It’s time for family fun with Movies in the Park on August 10. Come out to enjoy a free showing of the ever-popular “101 Dalmatians” in Wilder Park. Pack a blanket or lawn chairs, a picnic basket, kids and well-behaved dogs in the car and plan to arrive at Wilder Park any time after 7:30 p.m. The movie will begin at approximately 8:30 p.m. At Elmhurst Toyota, we love bringing the family to the annual summer tradition of Movies in the Park and hope you’ll join us on August 10. “101 Dalmatians” tells the story of dog couple Pongo and Perdita (and their human owners). When the dogs have a litter of puppies, they are stolen by the evil Cruella de Vil, who wants to make fur coats out of them. With the help of some animal friends, Pongo and Perdita set out to rescue their pups. When they find them, they discover that Cruella’s evil henchmen have stolen an additional 84 Dalmatian puppies, so they rescue all 101 of them. Even if you’ve seen “101 Dalmatians” before, you’re sure to enjoy this classic Disney film even more under the summer night sky in Wilder Park. This is the original, animated film from 1961 featuring Disney cartoons that kids will love. If you don’t want to bring food from home to Movies in the Park, you’ll find food trucks at the park selling lots of dinner and snack options. This is a family event, so no smoking or alcohol is allowed. If you bring your dog, it must be on a leash at all times. The park district requests that you pick up after yourself and your pets at the end of the evening. 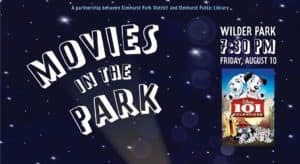 Movies in the Park is brought to you by a partnership between the Elmhurst Park District and the Elmhurst Public Library, with local business sponsors The Schiller Team, Edward-Elmhurst Health and Suburban Bank & Trust. Friday, August 10, 2018, 7:30 p.m. The movie begins at dusk, approximately 8:30 p.m. Call 630-993-8900 or visit www.epd.org.